"Just be careful not to pronounce the summit a historical one because we've had enough history in the Serb-Albanian relations". With these words ends the big article of Momir Turudic, a Serbian journalist, in the Vreme weekly, the issue from 23 October. The magazine dedicated in this issue many pages on the Serbian-Albanian relations on the occasion of the incident with a drone at the Partizan stadium in Belgrade when the first football match took place between the teams of the two countries. The game took place (or rather it didn't) on the eve of the, indeed, historical visit of Albania's Prime Minster Edi Rama in Serbia. Historical because it is the first in 68 years. Alas, Momir Turudic proved right - the visit was pronounced a historical one but it ended with the same "enough" history piled up for centuries in the Serb-Albanian relations. A provocation or the right of a position? As a typical state where there is no rule of law, Serbia approached the incident, during which a drone waved a flag of Great Albania over Partizan stadium in Belgrade, in a very KGB style. The entire state elite was engaged with the case, mass arrests were done, there were many statements unsupported by evidence, the bias and lack of objectivity prevailed. Prime Minster Alexander Vucic went as far as to blame the EU for not having interfered, although the Union was warned in advance that there were risks. Then the blame was thrown at UEFA for allowing the game to take place. No one asked at least once whether Serbia could have done more to prevent the incident. If Alexander Vucic knew in advance that incidents were possible for which he warned the EU why did he not undertake measures and what exactly did he expect of the EU? Why the first game between Serbia and Croatia in Zagreb last year went on smoothly, though with very tough security measures? The second match between the two countries in Belgrade, too, went on relatively well. Why did this prove impossible with Albania? Why a football game turns into an occasion for postponement of a long-planned political meeting at the highest level? It is true that the Olympic slogan was Sports for Peace, but, still, who sets the agenda of society - the football fans or politicians? And what is the indicator for a state's maturity - the behaviour of football hooligans or that of political leaders? And while the answers to these questions are awaited, many new have emerged. The summit between the prime minsters of Serbia and Albania - Alexander Vucic and Edi Rama - was postponed and took place on 10 November - just a day after a big historic event - the tearing down of the Berlin Wall that opened the way for unification on the continent and the final burial of historical conflicts and hostilities. In Serbia, there is an intensive talk that "guilty" for the summit are Chancellor Angela Merkel and the US who insisted on doing everything possible to organise it. Certainly, when she insisted on this summit Angela Merkel had good intentions. Last weekend, Croatia's first Deputy Prime Minister and Minister of Foreign Affairs Vesna Pusic said in a rare joint interview with her Serbian counterpart Ivica Dacic for the new regional TV N1 that until recently Germany suffered from Western Balkan fatigue but its interest to the Balkans has returned. Germany was a host in August of a big summit of the Western Balkans which will turn into a traditional forum. The contacts at the highest level have begun to intensify, although slowly. The reason for the renewed interest is that everything seems to be on the path of normalisation - Serbia starts negotiations, Albania has received a candidate status, Montenegro is negotiating, Croatia is already a member. Only the most problematic countries in the region remained - Bosnia and Herzegovina and Macedonia - but for them special solutions will be sought. Overall, everything seemed as if the Balkans' image as a powder keg is in the past. The first red lamp that the triumph was too rash came with the demonstrative military parade in Belgrade on 16 October, the culmination of which was the visit of Russia's President Vladimir Putin, welcomed as an emperor in the Serbian capital. The entire city and its vicinities were decorated by welcoming billboards and Serbia's state elite behaved with Mr Putin as if not they but the Russian head of state was the ruler. The visit took place right after the incident at Partizan stadium. During his visit, Putin unequivocally confirmed Russia's support for Serbia's territorial integrity, including Kosovo, for which he received President Nikolic's gratitude. No one afforded themselves to even hint to the Russian president that he has no reason to even raise the issue of Kosovo in a sovereign state. Alas, the Albanian Premier Edi Rama did not enjoy such tolerance. The press conference after the end of the talks between Mr Rama and Mr Vucic turned into a desperate fiasco which poured a cold shower over the EU's newly returned interest to the region. The behaviour of the Serb leadership did not at all match a country that is mature for EU membership because one of the fundamentals of the European membership is good regional relations. Without them the EU would have been unthinkable. The centennial anniversary from WWI is an illustration of this and it is no accident that it was the EU that received the 2012 Nobel Peace Prize. 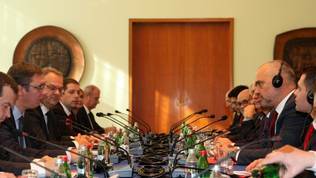 The meeting between Albania's and Serbia's prime ministers in Belgrade lasted more than planned. After the talks ended, the two leaders came out in front of a big crowd of journalists. First spoke Prime Minister Alexander Vucic who said that the Albanian prime minister's visit in the Serbian capital means a new beginning. The talks were not at all easy but, still, there was hope that the common problems can be resolved. It was not clear what exactly these problems are and why the talks were not easy but, according to Vucic, the first visit of an Albanian prime minister in 68 years is a good news not only for Serbia and Albania, but for the whole region. There was a consent to sign an agreement allowing the citizens of the two countries to travel just with ID cards. "We want our minorities - the Serbian in Albania and the Albanian in Serbia - to be a bridge of our cooperation and we would like to go together to the EU with important infrastructural projects", the Serbian prime minister added. When given the floor, the prime minster of Albania held a long and very honest speech. He noted that his meeting with Vucic took place just a day after the celebrations across Europe of the 25th anniversary of the tearing down of the Berlin Wall. It is a good coincidence that a day later Albania's flag is waving in Belgrade, that we respect each other's state hymns and that we meet after 68 years, he started. We share a lot of history together, without having been close to each other, but our future entirely depends on whether we can walk together toward Europe - a path that would be much harder if we, in the Balkans, walk separately, Edi Rama continued. We need mutual trust. Now are not the best days in the EU. Hope is giving way to fear in united Europe and there is no doubt that the enlargement fatigue endangers our societies with patience fatigue. There is no alternative to the enlargement project for us, the Albanian prime minister underlined. Further on, he said that he expects, because of the fact that the two countries are being governed by a new generation, a new chance. "I want to believe that the new generation that governs Serbia today will see and respect the Albanians in the Presevo valley as a bridge of strategic importance for the connection of our European fates. Enjoying all the rights as enshrined in the conventions, the European and international norms, is not only a desire but also a constitutional obligation which we will demand constantly of Serbia's institutions", Mr Rama said and continued stating that he wants the Albanians from the Presevo valley to enjoy all the attention from official Belgrade be it in terms of their "deserved" representation in the local and central structures but also in terms of their social and economic development. "I hope that the Serbian authorities know that the Albanians from the Presevo valley actively participate and encourage Serbia's EU integration process", he added. "Regarding Kosovo, we share completely different points of view but the reality is one and it is invariable. Independent Kosovo, recognised so far by 108 different countries across the globe and supported by the International Court of Justice, is an indisputable and irrevocable regional and European reality. It should be respected and it should turn, which is already beginning, into part of the European and Euro-Atlantic integration. I want to repeat here openly and honestly what I already said at the NATO summit". He reiterated his appeal Kosovo to be recognised by those European countries that have not yet done it because this is a matter of European security. "Let's be honest till the end - Kosovo's independence has made the Balkans a more stable region", the Albanian prime minster said and concluded: "A possible new perception of this reality on behalf of Serbia would be more than welcome to us". 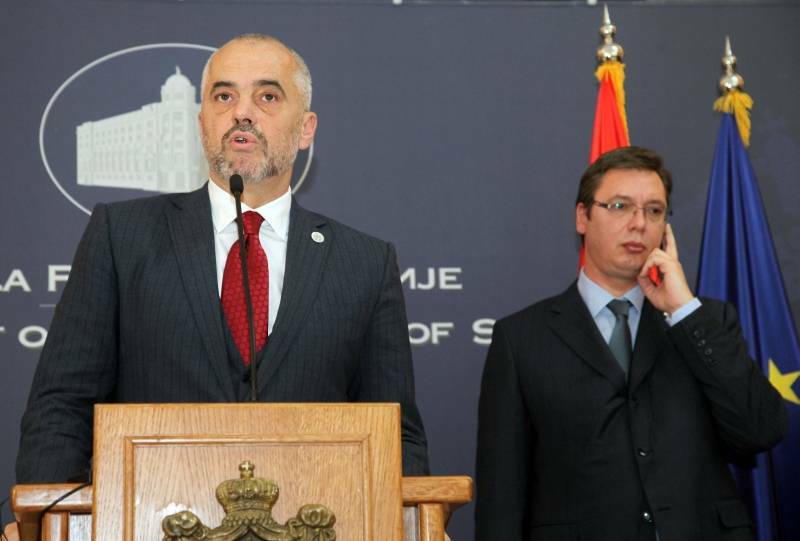 Edi Rama's long statement, broadcast live on Serbian and regional TV stations, caused rage and non-diplomatic behaviour of the Serbian prime minster, who took the floor violating the protocol to say that the Albanian premier's remarks were a provocation. He said he did not expect Rama to even mention Kosovo and Metohija, especially "in a context that was not foreseen in the programme of the visit". 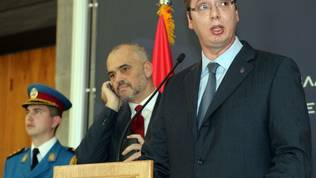 "I am sorry that Rama took advantage of this possibility to talk on a topic we have not agreed upon but it is my duty not to allow Serbia to be humiliated", Alexander Vucic said, repeating several times that the issue of Kosovo was not at all discussed during the talks between the two. According to him, Albania has no connection with Kosovo and has no reason to raise this issue at all. Edi Rama responded that, according to him, the fact that the two countries have different views in terms of Kosovo does not mean that they cannot share them. "Alexander, I assure you that you will not feel provoked in Tirana even if you share your position on Kosovo. We will just feel sorry because this is a renown reality, recognised by more than half of the UN. The sooner we recognise this reality, the sooner we will continue forward in all directions and means", the Albanian prime minister said and emphasised that not a word uttered by the Serbian prime minister, if he accepts the invitation to visit Tirana next year, will be perceived as a provocation. However, this did not help to reduce the tension. The press conference ended up without the two leaders to shake hands. The subsequent reactions were sharp and went much beyond the bon ton. The president, Tomislav Nikolic, published a special statement, read out on national TV, stating that he knew very well what Edi Rama would do and that is why he refused meeting him. Serbia has been working hard for two years and a half the Balkans to turn into a secure and prosperous region in Europe, but until there are such irresponsible politicians like Edi Rama it is clear that this will be a difficult task, filled with many challenges. "Albania will hardly be able to join the modern European countries unless it gives up its dreams about the hydra called 'Great Albania'", the statement of the Serbian President reads. In the central news programme, the material about the summit claimed that apart from Edi Rama's provocation, the behaviour of the Albanian journalists, too, was provocative. They snickered during the Serbian prime minister's statements, the national TV's reporter claimed. Alas, no video of that was showed but cadres of the reactions of the chief of the office for Kosovo Marko Djuric were showed how he turned his head in denial. Later he was a guest of the political programme OKO (eye) of the state-owned TV RTS together with Alexander Vulin, the minster of labour, and two former diplomats - former foreign minister Vladislav Jovanovic and Ivo Viskovic. The opinion of the four was highly critical. Minister Vulin even went as far as to call Edi Rama a "provincial politician" because his statement was aimed entirely at his own electorate. According to him, with such actions, including the drone incident at the Partizan stadium, attempts are made to see how far Serbia's patience can stretch. Marko Djuric said that the reason behind Edi Rama's behaviour were national complexes. Currently, in Serbia are queueing leaders of the highest ranks. Prime Minster Vucic had much more important meetings (sic! ), like, for instance, with France's Prime Minister Manuel Valls. The country will also be hosting a huge summit of Central and Eastern European leaders with China. Serbia is positioning itself as a factor in the region. The same cannot be said of Tirana and that is why they are trying to compromise these efforts, Mr Djuric said. All the four interlocutors made clear connections between the drone incident and the Albanian government, although the investigation has not finished yet and it is not clear what evidence there is. In Serb media prevails the same attitude to the case. In a commentary for the Vecernje novosti daily, entitled "Yataghan" (a type of Ottoman knife), Predrag Vasiljevic writes that "just like a drone out of clear skies, the prime minister of Albania, whom Serbia, as a good host, accepted with he highest state honours, surprisingly stabbed in the centre of Belgrade a new yataghan of hatred". 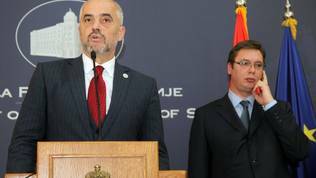 "Beyond protocol and diplomatic manners, far from the political tact, meanly and provocatively, Edi Rama stated that independent Kosovo is a reality Serbia should recognise". The EU's reaction was cautious. The spokeswoman of the European Commission on foreign affairs Maja Kocijanic said that the visit of the prime minster of Albania in Serbia should represent a turning point in the relations of the two countries and "we expect the two leaders to show renewed determination and political courage so that they would look into the future and rebuild a relationship after so many years". She recalled that the regional cooperation continues to be very important for the European perspective. The Serbian government should continue its efforts to foster the economic development of the Presevo region, she added. Enisa Bajrami, co-director of the Liberal Alternative Institute in Macedonia, is of the opinion that Premier Vucic's reaction was out of line. Prime Minister Rama visited Serbia hoping to break the ice of "hostility" between Albania and Serbia and to discuss new projects that could overcome the many prejudices between these two nations. 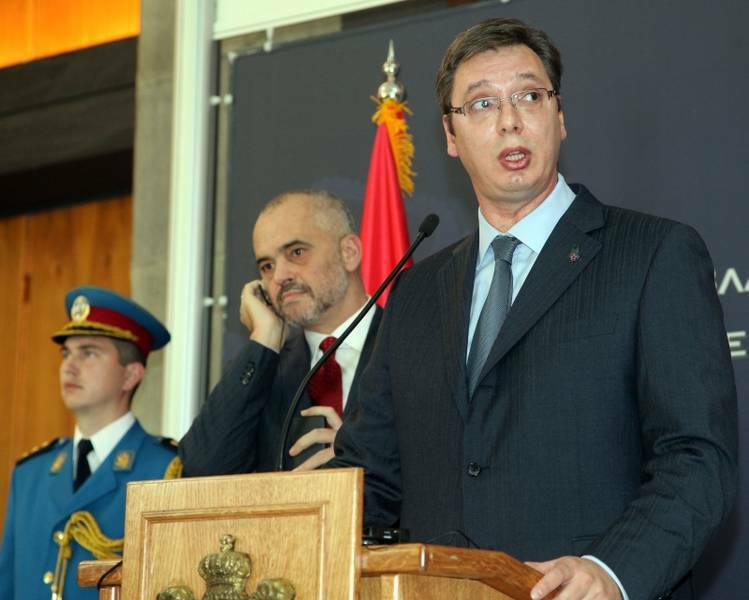 Prime Minster Vucic did not even wait for his host, according to the protocol or the Serbian traditions. In the same time, however, it is true that Albania has no connection to Kosovo as any country in the Balkan region, be it Macedonia, Montenegro or others. Premier Vucic is forgetting that Kosovo is a concern to all the countries that aspire EU integration and that respect self-determination and sovereignty. Therefore any leader who knows the values of these two aspects can freely comment on the Kosovo situation at anytime, she commented for this website. According to her, Great Albania is a myth. Albanians are already united through economic, cultural and social exchanges. There is no need to change borders in order to get untied. The myth of Great Albania is spread by politicians and interested groups who are installing fake patriotism to use the mass for personal interests. Luckily, many of us have moved on from complexes like this and our only concern is to see our countries members of the European Union family as soon as possible, she concluded. "Often, in Europe, can be heard the argument that Germany and France are the best example that reconciliation is possible after a bloody past, marked by countless victims on both sides in two world wars. Theoretically, this is completely true, however, the Germans and French reconciled in a period of prosperity in which the two countries live more or less today too. Where Albanians, Serbs, Macedonians, Montenegrins have lived in the past two decades and a half, often the only food the ruling elites offer them is hatred for the 'archenemy', mainly the neighbours, quoting 'our glorious past' and 'their crimes'. If the common condition of the people in this region can be described in a few words then rage, frustration, lack of hope and of better tomorrow are appropriate. In such an environment, hostility is accepted better than a vision of the common future", Momir Turudic writes for Vreme. The Albanian premier said that "the enemy is common and that is poverty, unemployment, the lack of perspectives for the young people, public debt, the deficit and, of course, the legacy from the past". Unfortunately, the Serbian elite failed to overjump its putinistic way of thinking which, for sure, will sober up the European elite who thought Serbia has irreversibly started to walk on the European path. To be able to walk on that path you need to accept the European system of values. It commands respect for the others, including their opinion. It strikes that President Putin is allowed to state his opinion and Albania's prime minster is not. More was expected of Serbia, especially against the backdrop of its pretences to be a factor in the region. The fiasco in Belgrade on 10 November was significant. EU should be cautious what lessons it will draw out of it. Last week, in the subcommittee on human rights in the European Parliament there was a hearing about the situation with human rights in the Western Balkan countries. In front of the attending MEPs, Tea Gorjanc-Prelević, Director, Human Rights Action NGO, Montenegro, said that the EU should not give up on the countries in the region if it wants them to develop rule of law. She urged the Union to encourage the governments to work for accountability because these governments listen only to the EU. Let us hope that Serbia would listen to Brussels as attentively as it does to Moscow. Congrat Adelina, your wrote better then a serbian and albanian journalist, writing neutral andanalysing all the facts. Well Adelina may not be joke but this "article" certainly is! Dear Adelina, take a deep breath an start reading any book about diplomatic protocol and diplomacy in general. After reading go back to this |article|, get your fact straight about this visit and ask yourself were did all go wrong, once again. Rama behaved poorly for a prime-minister, taking the advantage of being first PM of Albania in visit to Serbia in 68 yrs to give lessons to host country about what that country should do or not do. That&apos;s outrageous. Lawless? Go to Albania, or worse Kosovo, and you will see lawless. A closed clan society with no vestige of transparent and legitimate democracy whatsoever. These sort of biased and frankly bigoted articles have no place in a modern Europe. How is this article at all unbiased? The whole article is about how Albania has done everything right and serbia is so wrong and backward. Why is Rama bringing up Kosovo? Wasn&apos;t he talking about Albanians in Serbia? If so, then he sees Kosovo as part of Serbia, if not, then don&apos;t bring it up. Putin is seen as a friend in Serbia because of the similar cultures, plus Serbia&apos;s former allies have turned their backs on her. Why not show Russia friendshi? AHA Lawless? Go to East Chicago see how gangs run more than a half million people. this is for Jeff.